Arguably the most important and influential of all comedy producers/directors in British radio and television ( Duncan Wood is also a contender), Dennis Main Wilson was instrumental in promoting some of the most outstanding talents in post-war British comedy. He was an insightful nurturer of talent; those who benefited from his patronage include Spike Milligan , Marty Feldman , Tony Hancock , Peter Sellers , Barry Took , Ray Galton and Alan Simpson , and John Sullivan . Highly regarded by all who worked with him ( Johnny Speight described him as "one of the greatest of comedy directors"), Wilson created a standard of comedy that has rarely been equalled, let alone surpassed. A dedicated BBC man (at least until late in his career), he joined the corporation aged 17 in 1941 as a junior production assistant. Becoming personal assistant to Marius Goring in the German Documentary Unit, he soon found himself immersed in comedy, writing satirical anti-Nazi propaganda. War service in the army led to him becoming head of light entertainment at the radio station Nordwestdeutscher Rundfunk in postwar Hamburg. He remained there until 1947, producing comedy and variety shows as part of West Germany's de-Nazification programme. Rejoining the BBC upon demobilisation, he refused a position in the German Service, instead becoming head of auditioning in the variety department, where his propensity for spotting new comedy talent soon emerged. In these early years he recognised the potential of Bob Monkhouse , Tony Hancock and Peter Sellers , who Wilson saw performing low down the bill in London theatres. He also met the future Goons ( Spike Milligan , Peter Sellers , Harry Secombe and Michael Bentine ) at Jimmy Grafton 's pub in London's Victoria, an unofficial meeting place for ex-servicemen trying to break into show business ( Grafton himself was also a noted scriptwriter). Becoming a BBC radio producer in 1951, he almost immediately set in motion The Goons (1951-60; called The Crazy People for its first series), one of the ageless classics of radio comedy. Wilson produced the first three series up to May 1953. Later in his first year as a producer, Wilson was brought in to help the ailing Derek Roy show Happy-Go-Lucky (1951). He immediately fired the writers and appointed Derek Roy 's own gag writers as the show's overall scriptwriters. Thus began the careers of the young Ray Galton and Alan Simpson . His other radio productions included Forces All-Star Bill (1952-53) and Star Bill (1953-54), both scripted by Galton and Simpson and starring Tony Hancock ( Wilson produced the latter show in its 1954 incarnation only); The Guy Fawkes Show (5/11/1952), with Tony Hancock and Joy Nichols ; Askey Galore (1957), with Arthur Askey ; and the landmark classic, Hancock's Half-Hour (1954-59), which elevated Hancock and writers Galton and Simpson into the pantheon of comedy greats. Wilson produced the series until February 1957. That year, Wilson moved into television production, where, again, he would become renowned for his work in comedy. Initially, however, he worked largely in variety rather than comedy, including Glee Club (BBC, 1957), with the George Mitchell Singers ; the pop music show Six-Five Special (BBC, 1957-58), which he produced intermittently between November 1957 and August 1958; and 'A Sparrow in Fleet Street' (tx. 30/3/1959), a musical comedy in the series Musical Playhouse (BBC, 1959-60), written by and starring Charlie Chester . It was with Chester that Wilson first ventured into television sitcom, with The Two Charleys (BBC, 1959), with Chester and Eleanor Summerfield as a travelling variety act. It ran for just one series. His first comedy production to have an impact was Sykes and a... (BBC, 1960-65), featuring the irresistible teaming of Eric Sykes and Hattie Jacques as brother and sister (twins no less). Striking a chord with viewers, it ran to no fewer than nine series, although Wilson left after the fifth in 1962. It returned as Sykes (BBC, 1972-79), with Wilson as executive producer on the first of seven series. Wilson also produced the six-part Sykes and a Big, Big Show (BBC, 1971), which again teamed Sykes with Jacques . Other comedy programmes produced by Wilson in this period included The Rag Trade (BBC, 1961-63), a very popular series about industrial relations, starring Peter Jones and Miriam Karlin ; Lance at Large (BBC, 1964), an early work from David Nobbs (writing with Peter Tinniswood ) starring Lance Percival ; a one-off special with American comedian Allan Sherman , Allan in Wonderland (BBC, tx. 29/8/1964); and three BBC specials starring Terry Scott , Scott On... during 1964 and 1965 (the show became a series only in 1969, although Wilson did not produce). Wilson was one of those producers who recognised the importance of the writer. 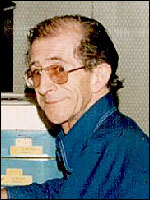 One he worked with several times was Johnny Speight , who had written the first series of Sykes and a... in 1960. Their most important collaboration, and the television work of which Wilson was to be most proud, was the groundbreaking and controversial Till Death Us Do Part (BBC, 1966-75). Alf Garnett, the racist, working-class Tory bigot (superbly brought to life by Warren Mitchell ), was one of British television's great comic creations, and the series' themes (primarily racism) and language generated acclaim and denunciation in equal measure. Controversial or not, Wilson received the BAFTA award for top light entertainment producer for his work on the series in 1968. Other Wilson / Speight collaborations included To Lucifer - A Son (BBC, tx. 29/6/1967) with Jimmy Tarbuck ; Them (BBC, 1972), a five-part series about two vagrants starring Cyril Cusack and James Booth ; the four-part Marty Back Together Again (BBC, 1974), with bug-eyed comic Marty Feldman ; and Galton and Speight 's Tea Ladies (BBC, tx. 4/1/1979), set in the House of Commons and starring Mollie Sugden , Dandy Nichols and Patricia Hayes . Feldman was another with whom Wilson enjoyed a long working relationship. He had written three Comedy Playhouse episodes produced by Wilson between 1964 and 1966, as well as the aforementioned Scott On... specials (with Barry Took ), before Wilson produced Feldman 's own vehicle, It's Marty (BBC, 1968-69). The series made Feldman a comic star, and won the Silver Rose at Montreux, the Writers' Guild of Great Britain Award for Best Light Entertainment Series and a BAFTA Award for Best Script ( Feldman and Barry Took ). Another writer Wilson promoted was John Sullivan . Working as a sceneshifter at the BBC, Sullivan approached Wilson with a script (such was Wilson 's reputation as a patron of comedy talent). Impressed enough with what he read, Wilson sold both the idea and Sullivan to the head of BBC comedy, Tom Sloane , and the script became the basis of a Comedy Special on 12 April 1977. Thus was Citizen Smith born. Starring Robert Lindsay as aspiring revolutionary Wolfie Smith, figurehead of the Tooting Popular Front, the special was produced by Peter Whitmore , although Wilson produced the majority of the ensuing series between 1977 and 1980. Sullivan went on to create that other South London-set series, Only Fools and Horses... in 1981. Wilson 's other 1970s productions included Well Anyway (BBC, 1976), written by and starring John Bird and John Fortune ; Mr. Big (BBC, 1977), with Rag Trade star Peter Jones , as a small-time crook, and Roger Doesn't Live Here Anymore (BBC, 1981), a black comedy series concerning divorce, written by John Fortune and starring Jonathan Pryce . However, he was becoming disillusioned with the BBC , viewing it as increasingly bureaucratic, limiting the freedom of the individual producer. Following L for Lester (BBC, 1982), a sitcom featuring Brian Murphy as a driving instructor, Wilson did what would once have been unthinkable - he left the BBC . He worked on only one further television series. For his old writing associate Johnny Speight , he directed (but did not produce) six of the seven episodes in the second (1984) series of The Lady is a Tramp (C4, 1983-84), featuring Patricia Hayes and Pat Coombs as two female tramps. Wilson briefly returned to radio, collaborating on a programme devoted to the history of British comedy for the BBC 's World Service. He died from lung cancer in 1997.